Chris Harrison is a Ph.D. student in the Human-Computer Interaction Institute at Carnegie Mellon University advised by Scott Hudson. He is also the Editor-in-Chief of ACM XRDS (formally Crossroads). His research focuses on novel interaction techniques and input technologies – especially those that enable (small) mobile devices to appropriate (large) everyday surfaces for input in clever ways. One of his projects caught our attention. Skinput, is a technology that appropriates the human body for acoustic transmission, allowing the skin to be used as a finger input surface. I know, this sounds Greek to you, as it sounds Chinese to me. So we let Chris to explain us what Skinput is. 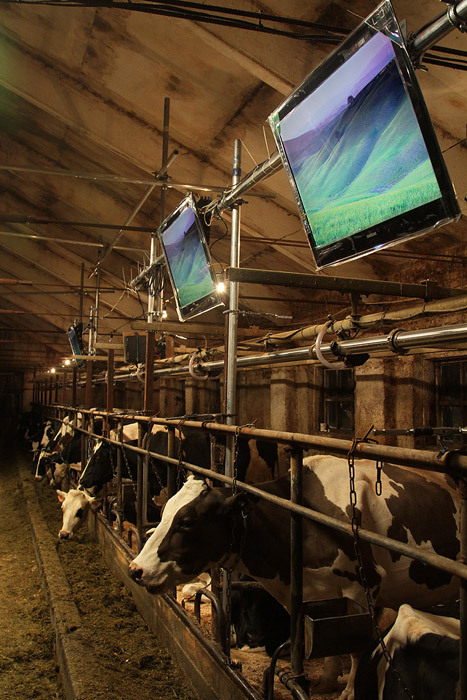 Holy Cow, DS for cows!?! Fifty years ago my parents “flew” from their home town in western Macedonia, Greece, in order to have a better future than being shepherds. So now here I am after so many years, having lost my hair in front of computers and being in the business of Digital Signage in Greece, trying to create a market in a struggling with the financial crisis country, to see that I did all wrong. My future is my past. The same past that my family tried to avoid fifty years ago. 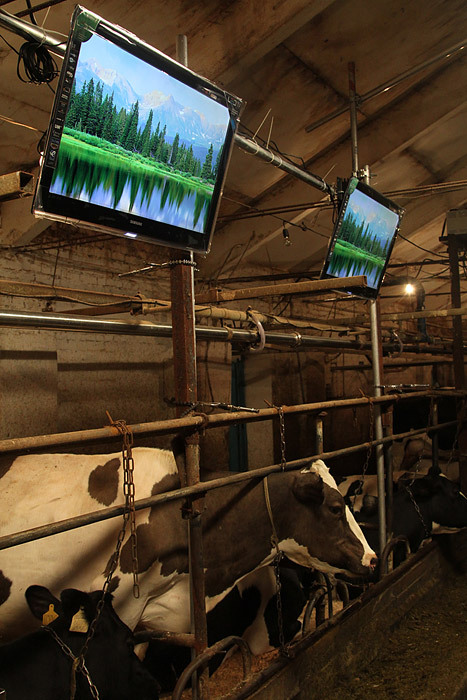 One Russian farmer decided to equip his cow barn with Samsung LED TVs. He is convinced, I don’t know from whom but I want him for my sales department, that cows get more happy and productive if they watch movies with green pastures. I thought that usually cows rather prefer to be in a green pasture than watch it, but on the other hand I’m a plain project manager. So he got a non-stop loop of world’s recognized green Swiss Alpine fields and got the most slim lcd tvs on market in Russia and then called the team of workers to install that all. Now they go into statistics to measure the outcomes. They compare the results from two groups of cows, one is watching tv another is deprived of this humanity most spread entertainment thing. It is amazing. In a country where lcd’s are not in the houses, yet, the start putting them in the stables. I’m living in the wrong country. It’s the world’s first piece of clothing for children that incorporates augmented reality technology. It was designed and developed by creative agency, Brothers and Sisters. Magic Tee can be found in Brights and Stripes a clothing brand for kids aged 0-5yrs, founded in 2006 in UK. No-one likes getting dressed in the morning. It’s boring. So imagine if your clothes came to life. Now with Magic Tee, you can make getting dressed fun. Pull on this special shirt and you could make it come to life around you. Children simply have to follow the three simple steps they will discover a magical world of weather that they control. Surface isn’t just to play with photos,Todd Clare demonstrates how one day, we will be able to drop a tablet computer on a special table and drag magazines onto our device. If this looks familiar, its is because you saw something like that in Avatar, when the scientist was “uploading” through drag and drop from the screen of a desktop system to his tablet, the graphic representation of Jake Sally’s brain functions.